The Design & Crafts Council of Ireland recognise the critical role that education and training play in the future growth of the Irish craft and design sector. Arts in education initiatives form a core part of the educational activities supported by the DCCoI. These programmes impact directly on the students, teachers and makers who take part, as well as playing a strategic role in informing art, craft and design education policy and curriculum. DCCoI currently have two core programmes CRAFTed and DesignSKILLS. CRAFTed is the DCCoI’s nationwide primary schools programme delivered in partnership with the Association of Teachers’ Education Centres of Ireland (ATECI). CRAFTed works with teachers, craftspeople and primary learners. CRAFTed aims to provide skills for life through positive, collaborative and joyful engagement with craft and design processes. By emphasising the making journey rather than finished products, CRAFTed allows space for experimentation, active learning and personal growth. It focuses on harnessing the creativity of every child, valuing individual creative expression. CRAFTed is unique in that it facilitates hands-on ‘in classroom’ learning with skilled Irish makers, promoting the insightful and innovative contribution they have to offer formal education environments. Additionally, it provides professional development opportunities for teachers and craftspeople keeping them up to date on best practice delivery of craft and design education, and emphasising the cross curricular potential of CRAFTed in areas such as literacy, numeracy, SESE and SPHE. At the core of CRAFTed is a desire to inspire the confidence of all involved, teachers, craftspeople and learners, so that they may engage with craft and design as a means to explore and grow their own creative skills. The Design & Craft Council of Ireland (DCCoI), in partnership Junior Cycle Teachers (JCT), are delighted to announce DesignSKILLS, a new Arts in Junior Cycle initiative for teachers and students of Junior Cycle Visual Art. DesignSKILLS is a nationwide post-primary level programme which aims to support the integration of the principles and key skills which underpin the Framework for Junior Cycle (2015), the Arts in Education Charter (2012) and the Creative Ireland Programme (2017 – 2022), Pillar 1 Creative Youth. The DesignSKILLS programme provides an opportunity for teachers of Visual Art, with their students, to work directly with a designer/maker. 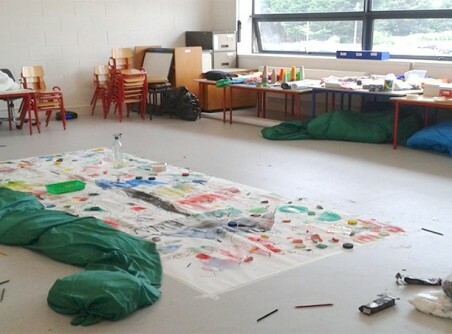 Junior Cycle Visual Art ‘provides the learner with a space within which it is safe to experiment, to fail and to learn’. Through DesignSKILLS, a designer/maker will work in partnership with teachers and their students to focus on the front end of the design process. The emphasis in DesignSKILLS is on investigating initial ideas, researching, experimenting and developing students’ own ideas through a range of hands-on practical methodologies and approaches, including using sketchpads.